If you have young children, they are going to climb wherever they can. Dresser drawers are ideal for climbing. Just pull out the bottom drawer and start climbing. You know they are going to do it regardless of how many times you tell them not to. Secure dresser to wall using a variety of devices such as clamps, screws, chord, etc. Just make sure that what happened in the picture in this post does not happen with your child underneath. 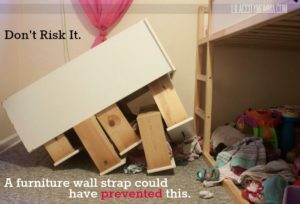 While the dresser may not be that heavy, it can choke a child if it falls on his neck. Go and fix this right now if you have young children! There are various ways to do this. The better manufacturers will provide you with instructions and the screws and clips needed to complete the job. If you do not have screws etc, you will need to do this your self. First locate the studs in the wall using a stud finder. Many people have them now so you should be able to borrow one from a neighbor, friend or family member. Next position the dresser in the location you want it to be and remove the top drawer. Screw large screws, at least 2 inches in length through the back of the dresser into the wall at the locations where you found the studs. Another approach is to screw L brackets to the wall and also into the dresser. This takes a little more time, however if done properly is much stronger than just screws through the back of the dresser. Another approach is to attach a strong chord to the wall at one of the stud locations. The other end can be attached to the dresser. Make sure it is securely attached and will not break or give way from the attachment device.